Sunday 2 August 2009 Hosted a luncheon for Rumah Charis Old Folks Home from 12 pm till 1.50 pm attended by President Nelson, Katherine, Lynda, Josephine & Jessie. Lynda & Jo brought along their mother, Jessie came with guest Ms. May Wong, ex-Lion Henry came with 10 guests with his 2 nephews and 5 Monash University Leos. President Nelson kick off with his light exercise routine, than Rumah Charis volunteer Ms. Ho briefed the guests on the conception of Rumah Charis. Monash Leos assisted in serving the lunch and members took time to mingle with the inmates. For the luncheon, my sincere thanks and appreciation to Ms. 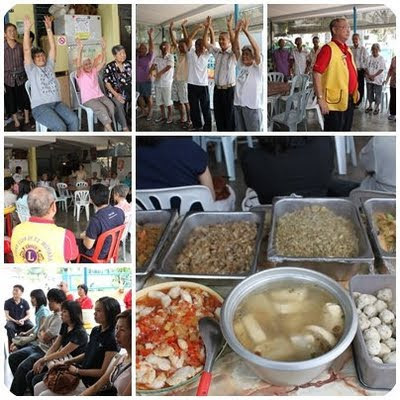 Fan of Yuet Sum Hin Restaurant (ex-Lion Henry's auntie) who sponsored 4 yummy vegetarian dishes, Lion Jo made chicken cheese balls, Lion Kat sponsored 30 pcs yong tau foo and Lion Jessie made sweet sour fish. As for non perishable items, the Club donated to the old folks and children's home 14 pcs blanket, 17 pcs pillow case, 14 pcs Kid's bag, 28 pairs socks, 20 pencil box, 7 bottles moisturiser lotion 45 pcs t-shirt, 60 pcs face towels, 2 boxes kitchen utensils of plates, bowls and spoons and 6 large bottle of liquid detergent. Henry's friend Mr. Yong Kuan Hon and Ms. Celine sponsored 2 bags 10-kilo rice and a few packets of biscuits. 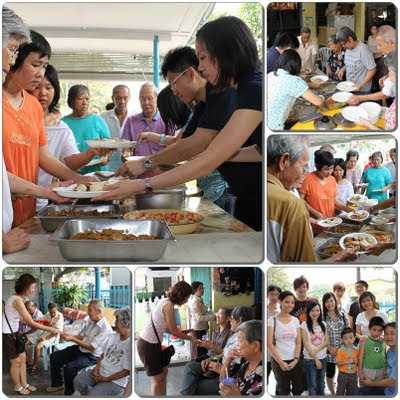 The project ended with Ms. May Wong personally handing out ang pow to the 22 inmates. Ms Ho later took the Leos and Henry's guests to view the Taman Yarl children's home. Here I wish to acknowledge cash sponsorship of RM250 from my friends Cindy & William Tan too. President Nelson expressed his thanks to members and guests for their attendance. He expressed his appreciation to members for the support, teamwork, commitment and dedication rendered to him during his term of office. He is confident that members will give the same generous support to him again and together the club will have another great year ahead. 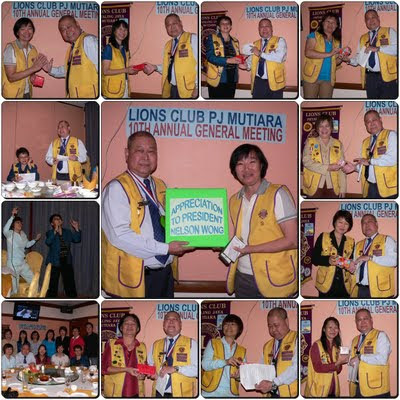 He gave appreciation to all members for their tremendous support and hope members will put in effort to increase Club membership to 20 by end of June 2010. 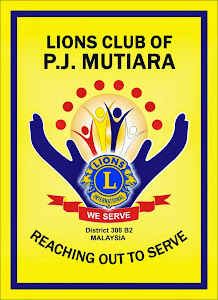 Lion Nelson Wong thanked members for giving him the mandate to be the President again for 2009/2010 and will try his best to uphold and keep the standard and image of the club. His expectation is not high and his goals are back to basic – Do What We Can Do. He trully appreciates members sacrifices. Nevertheless, it is the caring and sharing attitude of the members which is of utmost importance and hope that the members enjoyed serving the community as much as he does.